Anthony Chow, The Heart Hospital, UCLH NHS Foundation Trust. Alfred Buxton, Cardiovascular Division, Brown Medical School, Rhode Island Hospital. 1 Basic principles of pacing. Oliver R. Segal, Vias Markides, D. Wyn Davies, and Nicholas S. Peters. 3 Pacemaker implantation and indications. Aneesh V. Tolat and Peter J. Zimetbaum. 4 The ICD and how it works. Henry F. Clemo and Kenneth A. Ellenbogen. 5 Indications for the implanted cardioverter-defibrillator. 6 ICD follow-up: complications, troubleshooting, and emergencies related to ICDs. 7 Pacing therapies for heart failure. Rebecca E. Lane, Martin R. Cowie, and Anthony W.C. Chow. 8 Pacing in special cases: hypertrophic cardiomyopathy, congenital heart disease. Martin Lowe and Fiona Walker. 9 Lead problems, device infections, and lead extraction. Richard Schilling and Simon Sporton. I enjoyed the book. 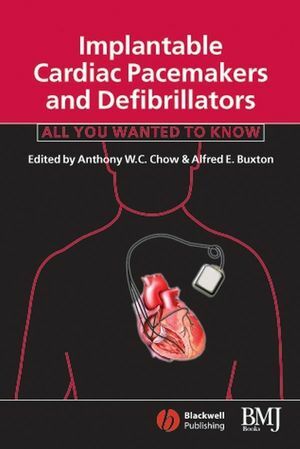 I found it interesting and appreciated the chapters and how they dealt with each sub-group of pacemaker implantation."